Loc Rocker: No more rubber bands! I've just about had it with these rubber bands. I've had them in for over 2 months and honestly...they ain't doing anything. They leave dents at the end of my locs and I have seen little to no progress with the locs actually marrying. Talk about an epic fail. 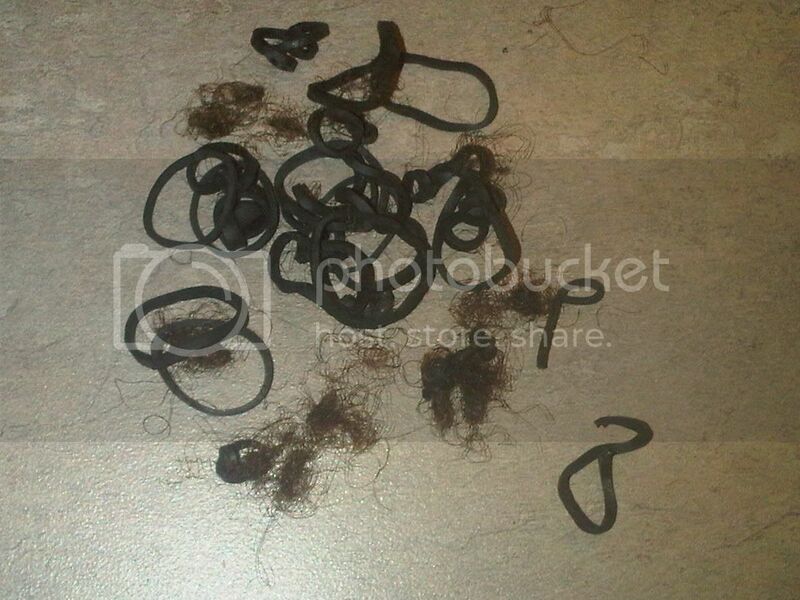 So I'm removing them all, picking out a bit to reveal some loose hair and 2-strand twisting them down. I did that with a few and it worked. Not sure why I didn't do it with all of them. Laziness, I guess? My locs made 6 months yesterday and I'm up here thinking that I don't do enough with them lol..
Sis, try knotting the locs at the ends. I do that to keep them together. Just try a few small pieces of hair together at the end and let them be. Twist them (or braid them), knot them and let be! I had the same problem when I had loose hair and when I was trying out my starter locs...I need to learn how to leave my hair alone, especially with the Hand-in-locs disease...Thanks for posting this, now I know I need to leave them alone. I've been following your progress for quite some time. We started around the same time, I may have started about a month before you. The only time I colored my hair was before my loced...since then I haven't used any chemicals to color, but I have used Henna. Every one learns from their individual journeys, but u also learn from other people's mistakes. I was always told to wait to dye my locs...or if you want to dye them...use henna. Chemical dying can literally dry out your hair, so it may be the culprit. Don't stress too much over the locs, just let them be, and they may start behaving. BTW- I have double-headed dragons everywhere and people can't tell unless I point them out. I think they're cool. When I had traditional locs, I would just do a small knot at the root and a small knot at the bottom, like mentioned before. Then I would just leave them be! A loctician once told me that it is possible to "worry your locs" to the point where they won't be healthy. Scared me straight. Hand in head disease is serious!